Adaxes allows scheduling the delivery of reports. This can be helpful, for example, to track and review information on a periodic basis or compare information collected at different periods of time. You can allow users to self-schedule reports, so that they can decide by themselves which reports they need and when. Apart from that, reports can be scheduled by administrators in a centralized manner. In this tutorial, you will learn how to configure self-scheduling of reports as well as how to schedule reports for specific users and groups. Users have the ability to schedule reports for themselves by clicking the button available when viewing a report. 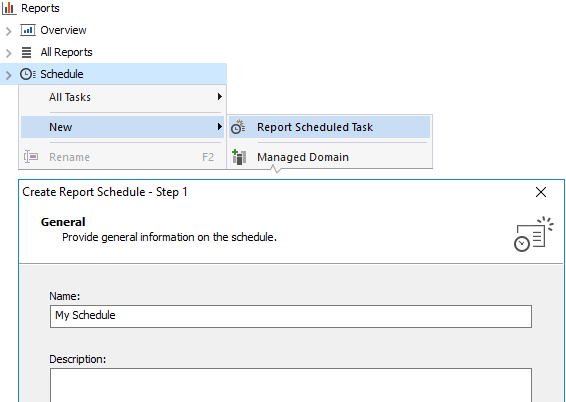 When scheduling a report, users need to select a schedule for report delivery. The list of available schedules contains only those that have the Allow for self-scheduling option enabled. This means that with the help of the option you can allow or disallow a particular schedule to be used for self-service. 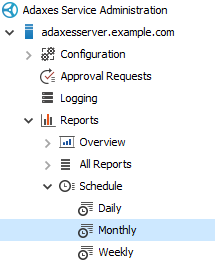 Launch Adaxes Administration Console, expand your Adaxes service, then expand Reports and Schedule. Select the schedule you need. If necessary, you can create a new schedule. Right-click the Schedule node, select New, then select Report Scheduled Task. Follow instructions of the wizard that appears. Specify whether the schedule is enabled for self-scheduling using the Allow for self-scheduling option. In addition to self-scheduling, when users choose which reports they want to receive by themselves, the delivery of reports can also be scheduled in a centralized manner. For example, you can schedule a report for all members of a group, users located in a specific Organizational Unit, users that match certain criteria, etc. Click the New button located under the report list. This will bring up the Schedule Report wizard. 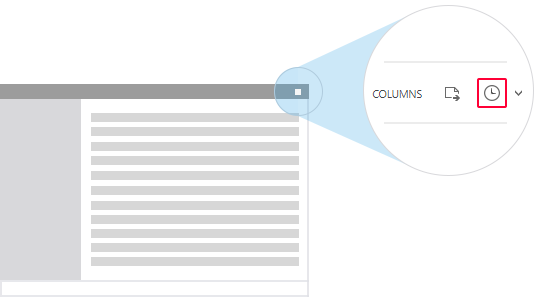 In the Report field, specify the report you want to schedule. You can also specify a custom title that will appear in the report document instead of the report name. 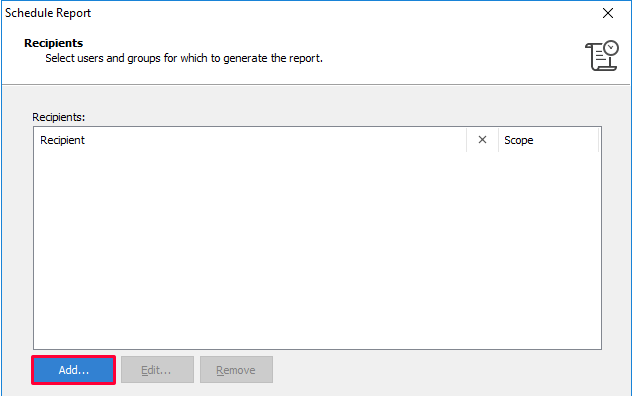 Now, you need to specify settings for report generation. You can configure the report scope and parameters in such a way that they will be different depending on the user who receives the report. For this purpose, you need to use value references (e.g. %department% or %company%). The value references will be replaced with the corresponding property values of the recipient's user account. In this example, the scope depends on the recipient's company specified in AD. In the following example, the value of the Department parameter will be the same as the recipient's department specified in AD. Here, you need to configure the report document settings. You can set a header image, title color, footer text and font for documents generated by Adaxes. The settings are common for all documents, including report documents and documents generated during data export. To configure the settings, click the General document settings link. On this step, you need to specify how the report will be delivered to users. You can configure the file path in such a way that it will be different depending on the user who receives the report. For this purpose, you can use value references (e.g. %department%, %username%, %homeDirectory%). The value references will be replaced with corresponding property values of the user account. In this example, the file path for the report document includes the user's department and username. Similarly, you can use value references to include property values of the user account in the email message. In the following example, the body of the email message includes the recipient's full name. On the final step, you need to specify recipients of the report. To do this, click Add. The Add Recipients dialog will appear. Expand the Object Types drop-down list and select Organizational Unit. Then, select the OU you need. Members of a Business Unit. With the help of Business Units, you can schedule reports for users that match certain criteria, no matter where they are located in Active Directory. For example, a Business Unit can include users from different domains or even forests whose job title contains Manager. For more details, see Create Business Unit. Click the arrow button embedded in the Look in field and select Business Units. Then, select the Business Unit you need. You can also exclude specific users, groups, OUs, and Business Units from the list of recipients. For example, if a report is scheduled for all members of a group, you may want some specific members not to receive it. 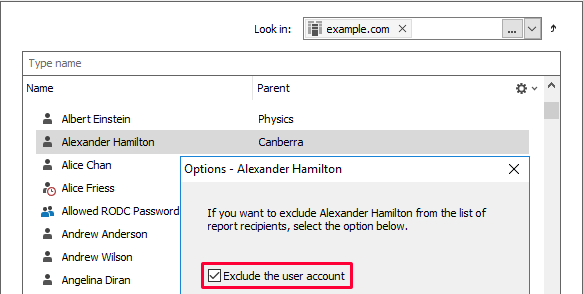 Select the Exclude checkbox in the Options dialog that is shown when adding recipients. When done, click OK, then click Finish.